Floyd Mayweather says Andre Berto will be "no pushover" and has defended his decision not to face British welterweight Amir Khan. 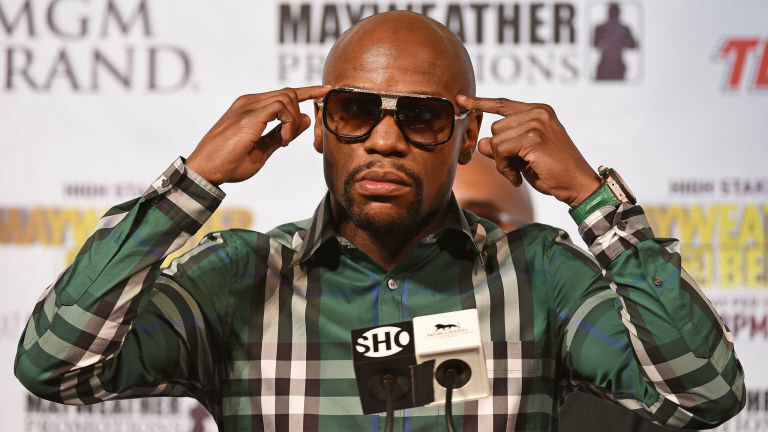 Mayweather (48-0-KO26) faces his fellow American at the MGM Grand Garden Arena on Saturday and has vowed to call time on his outstanding 19-year professional career following their bout in Las Vegas. The unbeaten 38-year-old, who has held world titles in five separate weight divisions, has faced criticism for choosing to face Berto (30-3-KO23) in his final fight. IBF world welterweight champion Kell Brook accused Mayweather of "playing it safe", while Khan has continually spoken of his frustration at being overlooked for a clash with the American. Brook and his fellow Brit Khan were among the candidates touted as potential opponents for Mayweather following his unanimous points decision victory over Manny Pacquiao in May. Mayweather, however, has defended his choice of opponent and even claimed there is no difference between the credentials of Berto and Khan. "Berto is not a pushover, but no matter who I chose, the media was going to have something to say. The critics were going to have something to say. He's no different from Amir Khan," he said. "Amir Khan has three losses and Berto has three losses. He's a two-time world champion just like Amir Khan. Virgil Hunter (Berto's trainer) is a remarkable trainer and he's done remarkable things with Andre Ward's career. "I know what it takes to win a fight of this magnitude. So no matter what anyone says, it comes down to the two competitors and I know what I can do. One thing I can do is fight." If Mayweather overcomes Berto, he will equal former heavyweight world champion Rocky Marciano's record of 49-0. But Mayweather insists there is no chance of complacency creeping into his psyche as he prepares for his boxing curtain call [Source : Sky Sport].